PALMDALE – The Los Angeles County Sheriff’s Department’s Recruitment Unit will be in Palmdale and Lancaster at two job fairs next week. On Tuesday, April 16, the team will be at the Palmdale Gain Office Spring Job Fair, which starts at 10 a.m. at the the Palmdale Gain Regional Office, located at 1050 East Palmdale Boulevard. On Wednesday, April 17, the LASD Recruitment Unit will be at the Antelope Valley College Spring Career Information and Job Fair, which starts at 8 a.m. at Antelope Valley College, located at 3041 West Avenue K in Lancaster. “Recruiters will be on hand to answer your questions about the academy, the backgrounds process and salary,” according to a news release from the Lancaster Sheriff’s Station. 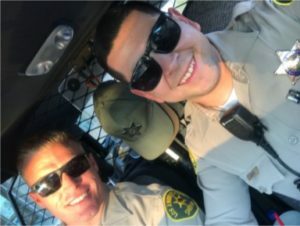 The Los Angeles County Sheriff’s Department offers several career tracks with more than 350 specialized units, according to the Department’s website. 19 ½ years of age at the time of filing and 20 years of age at the time of hire. Valid California class “C” driver license or higher at the time of filing. Out-of-State applicants must have a valid driver license from the state in which they reside at the time of filing and will be required to obtain a California class “C” or above driver license, prior to hire. For more information, visit: https://careers.lasd.org. 11 comments for "LASD Recruitment Unit coming to Antelope Valley next week"
Hmmm. I wanna be better than everyone and have authority over them to make up for all the times that I’ve felt the illusions of inferiority. I should be a Baptist… Na. I know, I’ll be a Lancaster cop. You left out the special ‘committing federal crimes’ unit that becomes available once a certain amount of seniority is accrued. Everyone here with a CDC card or number raise your hand. I still see some of the group is missing. Where are you Alexis. It’s time to call all law enforcement corrupt. Funny how all cons want people to see them as new and refreshed yet bash all law enforcement. A few bad cops and suddenly they are all bad and nonredeemable. Rob a store, hit someone with an axe, whatever…..suddenly you all become saints and want everyone to overlook your past. Here I am “Parolee Partier.” You presume too much, but that’s o.k. I took responsibility for what I did, paid my restitution, did my community service, did my time without complaining. I will be labeled a felon for the rest of my life, and I accept the consequences without complaining. Corruption in law enforcement has nothing to do with me. When I broke the law I wasn’t a cop. When a cop breaks the law they should be held accountable, but sadly too many are breaking the law with impunity. I’m just a grateful law abiding citizen giving back, and paying my taxes. Corruption in law enforcement is a huge problem in this country, and is part of the massive distrust people have in those that are sworn in to uphold the law, not break it. I don’t have a problem with there being “a few bad cops.” My problem is with there not being any good cops. If there were the bad cops wouldn’t be allowed to just keep on doing what they do while counting on their “brothers in blue” to just skip enforcing the law in their case. By the way, what’s a “CDC card”? Really Tim…..your pretend ignorance is humorous. CDC= California Department of Corrections. It is your felon ID card. Open your wallet. All cops, all 850,000 in the US are corrupt…..or narrow that down, all 11,500 in LASD are corrupt. You need a tin foil hat. The CDC hands out ID cards? WTF for? That’s got to be a joke, right? “Felon ID, don’t leave home without it”? I’d have to see one to believe this. As to my need for a tin foil hat…how often do you see cops enforcing the law on other cops? Cops drive their cop cars like they are totally above the vehicle code, and no cops say anything to them. I had one pass me on Avenue M doing about eighty, then watched him cut off the guy in front of me so he could turn into the courthouse. I went in and told the cops in the lobby that crap like that is why I have no respect for cops in general, and if they wonder why citizens throw parties when one of them gets shot there’s their answer. Of course they were outraged at my lack of respect (not a crime) and totally unconcerned about their fellow officer’s reckless driving (a crime). Then they get in their own cars and mark them with a license plate frame so they can be just as reckless and dangerous off duty as they are when they are on duty. A friend of mine got blatantly run into on the freeway, and when she and the other driver pulled over and exchanged information she noticed that he pretty much started interrogating her and guessed that he was a cop. Her insurance company couldn’t figure out how there was damage on her right front fender and damage on his left rear quarter panel when the police report said that she had cut him off. She told them the other driver was probably an off duty cop and they just gave up and paid, because the cop on scene who made the report was undoubtedly going to stick to the story and protect his bro. There was a stolen car being chased not long ago, and a big deal was made about how dangerous it was having that total blackout tint on all the windows because the cops couldn’t see the guy inside. Of course, the guy didn’t steal the car and then tint the windows, the illegal tint was put on for the owner…who was a cop. And unfortunately there’s no indication that it is limited to the relatively petty world of the vehicle code. Every time someone gets the crap beat out of them in a police station you should ask yourself, “what made that cop think they could do that and NO ONE would report them?” Every time they get caught by an outside agency there’s the cop(s) who did it and a bunch who were (of course) in some distant part of the station and didn’t see a thing. But how did the perpetrators just assume none of their fellow officers there would enforce the law on them? Here’s a hint: BECAUSE IT HAPPENS ALL THE TIME AND THEY NEVER DO. The outside investigation didn’t just pull a rabbit out of the hat and happen upon the only time it happened. Parolee Partier…I don’t have a felon card in my wallet.